Dishes with beans are some of my favorite vegetarian sources of protein, and I especially like them flavored with many kinds of spices, such as this chana masala (chana = garbanzo beans/chickpeas; masala = spices). If you like Indian food, then chana masala is a must to add to your repertoire because it truly is easy to make. You can serve it with flatbread or brown rice, and I garnish it with cilantro and plain yogurt. 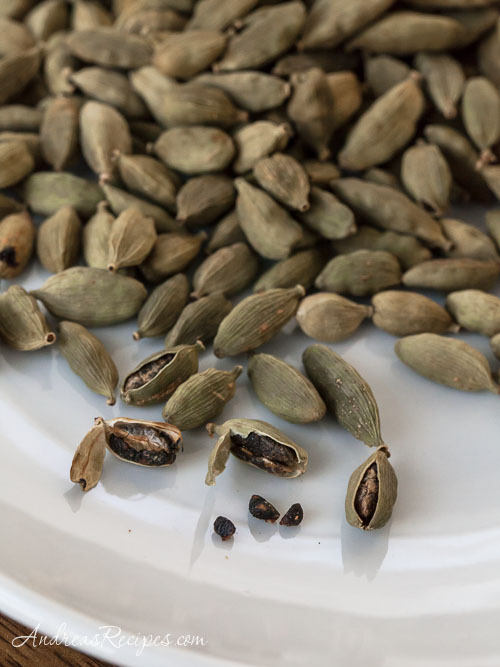 Cardamom is a spice that is native to India, Bhutan, and Nepal. Its potent flavor comes from tiny seeds contained in the pods, and just a few of those seeds will add an abundance of flavor to any dish, though the pods can also be used whole. The seeds can be used whole or crushed, but will loose flavor quickly once the pod has been opened and even more quickly when ground, so store the pods whole in an airtight container away from light. I typically buy cardamom seeds and other Indian spices from a large international grocery store. If you don’t have an international store in your area, check any well-stocked grocery store with a section for international foods. And if that doesn’t work, you can always try begging for some at an Indian restaurant. 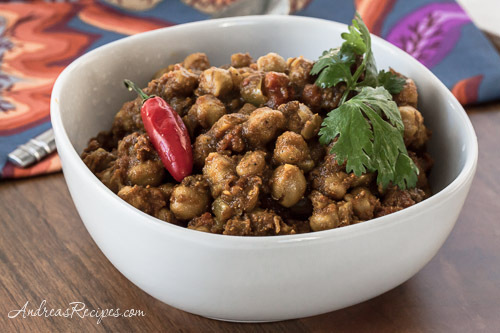 This chana masala uses three cardamom pods which are cooked whole in a small amount of oil with coriander seeds, cumin seeds, small hot chilies, and stick cinnamon. This releases the fragrance before adding the onions, which will soak up the spicy flavors and make your kitchen smell wonderful. The masala has two other ingredients that may be unfamiliar: tamarind paste and amchoor (green mango powder). These can also be found in international grocery stores. I like to make this with dried garbanzo beans cooked in a pressure cooker, but you can also soak the beans overnight and add directly to the pot. In a pinch you can use 3 (15-ounce) cans of garbanzo beans, just remember to drain and rinse them. Makes about 6 cups, serves 4 to 6. 1. Cook the garbanzo beans in the pressure cooker according to the manufacturer directions. 2. In the small bowl, stir the ginger, 1 tablespoon garam masala, turmeric, and garlic together with 3 tablespoons of water to make a paste. Set aside. 3. Heat the oil in the large pot over medium-high heat. Add the coriander seeds, cardamom pods, chiles, and cinnamon stick and cook until fragrant, about 1 minute. Add the onions and cook until lightly browned, about 8 minutes. Stir in the spice paste and cook for 3 minutes. Drain the tomatoes and reserve the juice, then add the tomatoes to the pot and cook until slightly reduced, about 4 minutes. 4. Add the tamarind paste and drained garbanzo beans, and bring to a boil. Reduce heat to medium-low until the liquid is reduced by about 1/4, about 45 minutes. Add the remaining garam masala, tomato juice, amchoor (optional), and salt. Serve with cilantro and yogurt for garnish. This looks amazing, Andrea! I love Indian food but I’ve never made this particular dish. Can’t wait to try it! I love that this starts with beans cooked in the pressure cooker! Hi Kalyn! Love my pressure cooker. I’ve been thinking about trying the whole thing in a pressure cooker or slow cooker. Would certainly be very easy.